Anyone impressed with the precise road manners of European touring sedans may not expect to find one in the showroom of an American luxury car brand. But the Catera, Cadillac’s mid-size sedan imported from Europe, matches German machines in performance and surpasses them with luxurious comforts and high-tech standard equipment. In effect, Catera amounts to an athletic sports sedan. It has the power and taut independent suspension system of a BMW 3 Series or Mercedes-Benz C-Class sedan. But it also has the plush interior features of an American luxury car along with the sophisticated safety hardware of a Cadillac. As the only rear-wheel-drive car from Cadillac, the Catera runs against the Cadillac norm of large cars constructed with front-wheel drive and the resultant nose-heavy weight balance. The Catera is balanced and predictable when navigating a snaky set of curves, but energetic at high speed for long stretches on a freeway. For 2000, Cadillac has honed the Catera by refining its exterior styling, reworking the interior gear and tweaking the suspension and powertrain. The result is a more aggressive character. Just one model is available. The $30,860 Cadillac Catera comes with a 3.0-liter V6 and all the standard equipment expected of a luxury sedan. For an additional $2000, a new Sport edition molds the Catera persona to a hard edge. 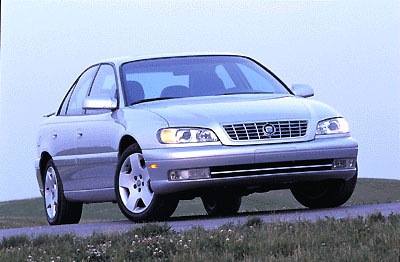 Cadillac redesigned Catera’s styling for 2000. The original Catera appeared bland in the homogenized blend of bumpers, fenders and smooth quarter-panel sides. The revamped Catera for 2000 looks stronger. It’s a concise package set with muscular flanks, crisp tailored curves uniting taut surfaces, a nose fixed with new lamps, and revised grille and fascia. The rear sports new taillights and a new center brake light, all composed of light-emitting diodes (LED) that flash brighter than incandescent bulbs and light up twice as quickly. Catera hunkers in a low posture underscored by the aerodynamic fascia and shapely moldings set below door panels. The Sport package attaches more aggressively styled rocker moldings and a spoiler on the rear decklid, plus 17-inch aluminum wheels, high-intensity Xenon headlamps and a front grille in matte black and chrome. Overall length of the car was pared by 1.8 inches in the new treatment, with different quarter panels aboard, larger side mirrors, a higher hood cowl that conceals new wet-arm windshield wipers, and altered corner lamps and fog lights. The concise new form moves Catera more closely in style to other German touring sedans. Core ingredients of Catera come from Opel, a European brand of General Motors that produces the respected Omega MV6. Catera uses a reinforced version of the Omega’s chassis, which is assembled at a GM plant in Germany, and it contains a twin-cam V6 engine built by GM in England and a four-speed electronic automatic transmission out of another GM plant in France. To this international slate of components, Cadillac contributed unique styling, noise-reduction measures to tune the vehicle for quietness, some Cadillac-designed safety equipment, and a more luxurious interior. In the five-place passenger compartment, the 2000 Catera reveals subtle changes in tone and texture to appointments with the relocation of certain controls and fresh designs for the instrument panel, center dash stack and console. Catera Sport models use brushed silver accents around instruments, shifter console ring and doors. White-on-black analog instruments include a speedometer and tachometer in center positions surrounded by gauges for coolant temperature, oil pressure, voltage and fuel. The Sport package also adds seat heater elements, a Bose sound system, and a power sunroof. On the driver-side front door, a new trim panel integrates door handles with repositioned power window toggles and two low latch-lid storage bins. Window switches provide one-touch express up and down movement for all four side windows, with pinch-guard protection that senses any resistance to closure like small fingers in the path, then reverses the path traveled by the glass. Leather-covered seats are now in all Cateras. The Sport package uses firmer seat bolsters and lumbar support and adds a thigh adjustment. A rear bench seat splits the seatback and folds in sections. Trunk access is available through a panel behind the center armrest for longer items. More safety equipment goes into this Catera, including seat-mounted side-impact airbags along with frontal airbags, three-point safety belts for all five positions with height adjustments on the four outboard seats and head restraints that move vertically to fit. Overall, Catera feels luxurious and comfortable, and it has power controls for everything, plus a high content of premium appointments. With its European pedigree and multi-national production chain, Catera was bred to run long on straightaways at autobahn speeds but also move in a predictable manner when traversing a set of curves. It rides on a stiff unibody chassis balanced by a front-mounted engine and tail-loaded differential driving the rear wheels, and contains tractable steering and suspension hardware that allow lively pavement maneuvers. In testing the new Catera Sport, our drive from Paris to the chateau-studded Loire Valley was intended as a leisurely roll through the French countryside. It included high-speed toll roads to skirt Chartres and other urban centers followed by narrow asphalt strips through rolling hills of a rich farmland laced with quaint villages. Yet a tepid pace was not the way our Catera wanted to play those routes. It obviously liked to romp, to run hard on the freeways and chart a smart line through back-road curves, and we were only too eager to comply with the feel and tone of this tight new iteration. Although it’s a relatively hefty package (3770 pounds), Catera puts a decisive snap in the throttle. The iron-block engine, fitted with a multi-ram induction system, shows a revised camshaft profile for 2000 models, with new electronic throttle controls. Tinkering with the airflow produced a denser mixture of air and fuel in the cylinders, resulting in more power available across a wider band of torque. Top speed, electronically limited due to tire constraints, extends to 125 mph. Even at the upper limit, the Catera feels entirely stable with the suspension settling nicely in corners and over bumps. It was also surprisingly quiet, reflecting Cadillac’s measures to deaden engine noise and streamline the package for better wind management. Shifts were quiet and unobtrusive. The four-speed automatic transmission has electronic controls with adaptive logic to tailor shift patterns to an individual’s driving style. Finger buttons on the console let you choose from three shift programs: normal, sport (with aggressive shift patterns that move the shift point to a higher engine speed), and winter (with third-gear start to minimize wheel slippage). Suspension, independent at all corners, adapts continuously to nuances of pavement irregularities and rebounds quickly without harsh action. Components range from MacPherson struts in front with hydraulic control arm bushings to a rear multi-link trailing arm design with automatic load leveling that permits full suspension travel under various loads. The steering mechanism on Catera has power controls in a recirculating-ball design that translates less road shock to the steering wheel and thus imparts a more luxurious sensation to the driver. Steering gear calibrations manage both comfortable low-speed turning and steady force for cruising at speed with an excellent on-center feel. Brakes with a disc at each wheel tied in dual circuits also connect to Bosch ABS/ASR 5.3 anti-lock and traction control systems. A calibration change to the power brake booster brings a more confident feel to the brake pedal. With anti-lock and traction control systems aboard, the Catera’s tires rarely slip, even during dicey maneuvers like the tight corner we entered with too much speed that required simultaneous braking and steering to get through the bend. Catera’s faster-to-deploy LED brake lights contribute an additional safety factor because they give a trailing driver more time in warning that the driver is braking. When applying brakes at 60 mph, for instance, the quicker flash point works out to more than 17 additional feet of warning distance for a tailing driver. We thoroughly enjoyed playing with the Catera Sport and were surprised at how gutsy it acted. Earlier versions did not meet this expectation, and the taut new tone obviously elevates this car to a better position against competitors. Head/hip/leg room, f: 38.7/54.6/42.2 in. Head/hip/leg room, r: 38.4/55.9/37.5 in. Cargo volume: 14.5 cu. ft.